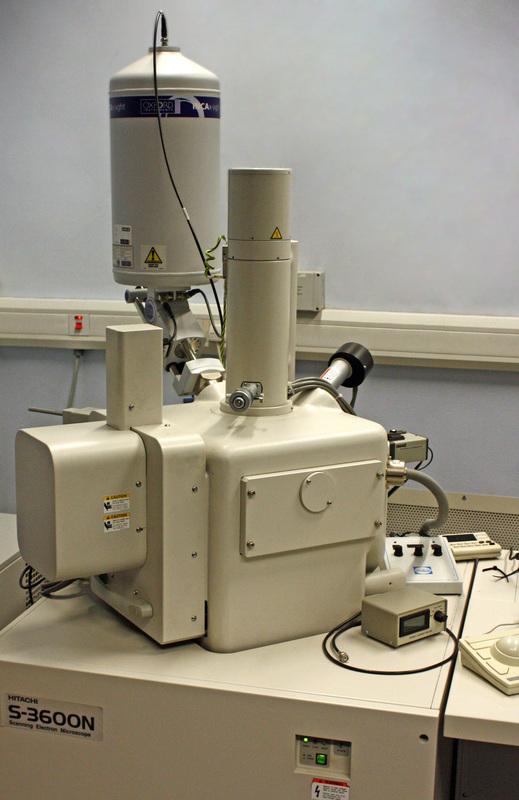 A high vacuum, thermionic emission (tungsten) instrument principally used for surface topograhical observation and recording of dry samples biological samples. Hydrated biological material requires controlled drying procedures e.g. critical point drying (CPD) prior to observation. Use for: TIRF imaging; Screening; bright field/DIC imaging; fluorescence imaging; fixed and live cell imaging; multi position imaging; imaging of samples on slides, dishes and multi well plates; time series; Z-series. With funding from the University Equipment Fund this system has been upgraded with Nikon JOBS software and a 20x objective in August 2013. The JOBS software is a module of NIS-Elements which allows us to use this microscope as a screening station, using slides, dishes or multi well plates. 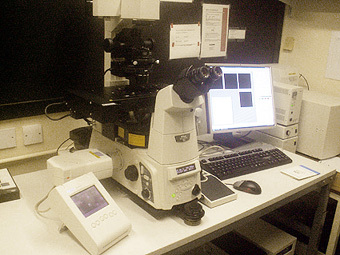 The Nikon TIRF microscope is a fully motorized system build on a Nikon eclipse Ti microscope. 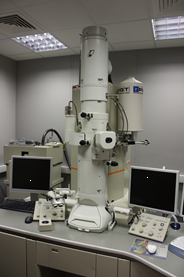 This microscope is has a 488 nm and a 568 nm laser for TIRF and a LED light source for the wavelengths 365nm, 490nm, 565nm and 635nm for normal epifluorescence microscopy. 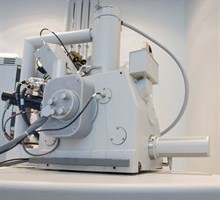 For fast live cell imaging a dual filter block for excitation with 490 nm and 565 nm has been installed on this system. This filter block can be used for both LED and TIRF imaging. 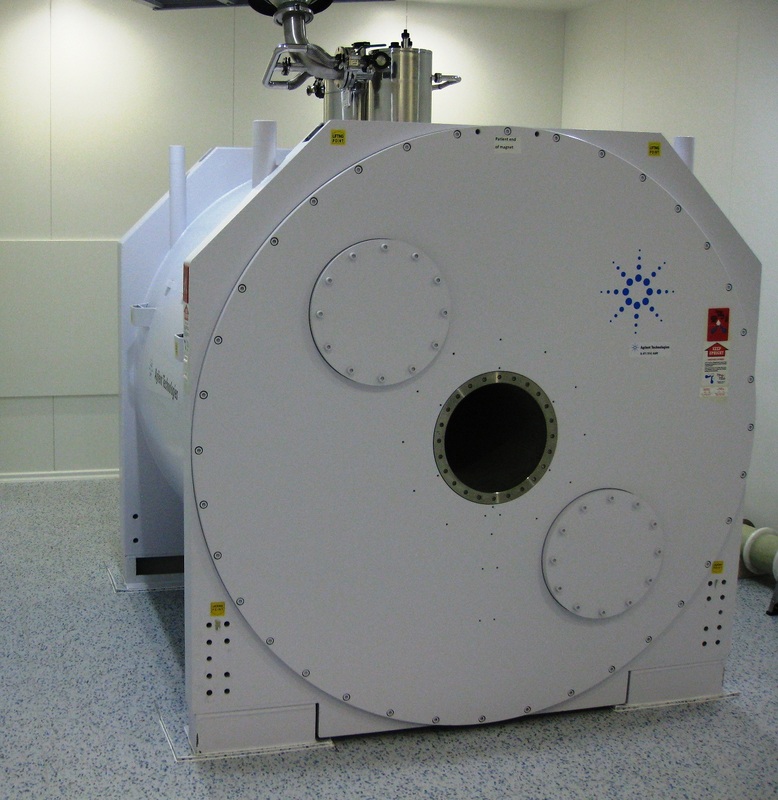 The system is has an environmental chamber with CO2 and temperature control as well as the Nikon Perfect Focus System (PFS) to keep the samples in focus during long live time imaging experiments. 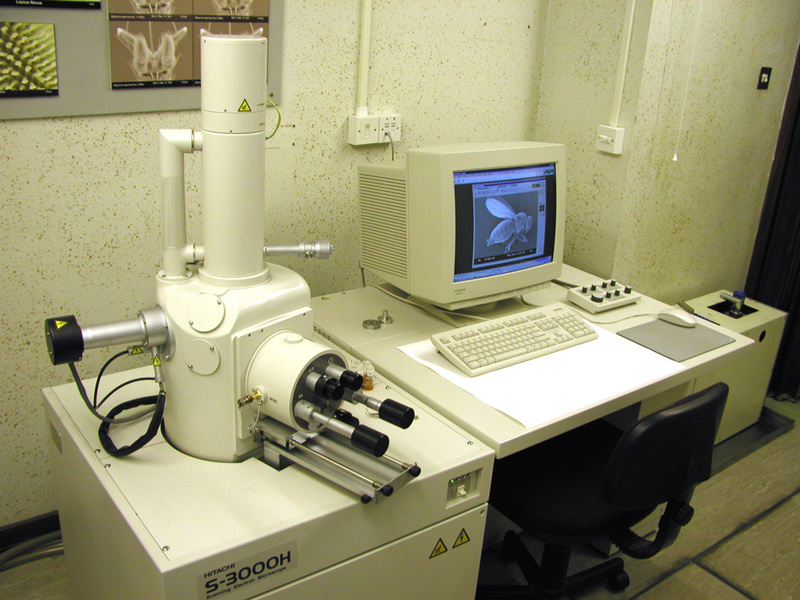 For image acquisition an Andor iXonEM+ EMCCD DU 885 camera is attached to the microscope. This camera can operate in both EM-CCD and CCD mode, has a pixel size of 8 x 8 µm and an image size of 1004 x 1002 pixels. 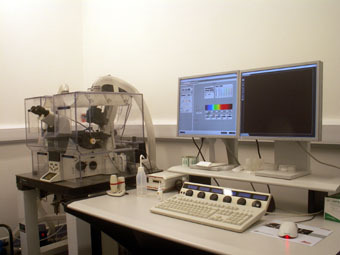 Multiphoton systems are used to image deeper into the sample. Using a normal confocal laser scanning microscope images can be taken up to 50 µm into the sample. This system should be able to image to a depth of around 1 mm. 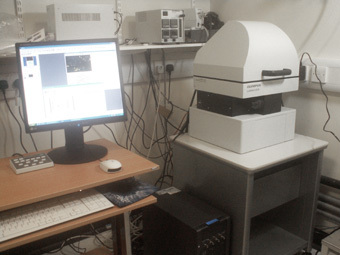 This microscope is only for multiphoton imaging and is equipped with a Mai Tai eHP DS Ti:Sapphire pulsed laser (< 70 fs pulsewidth) with DeepSee dispersion. The laser is tunable between 690-1040nm. 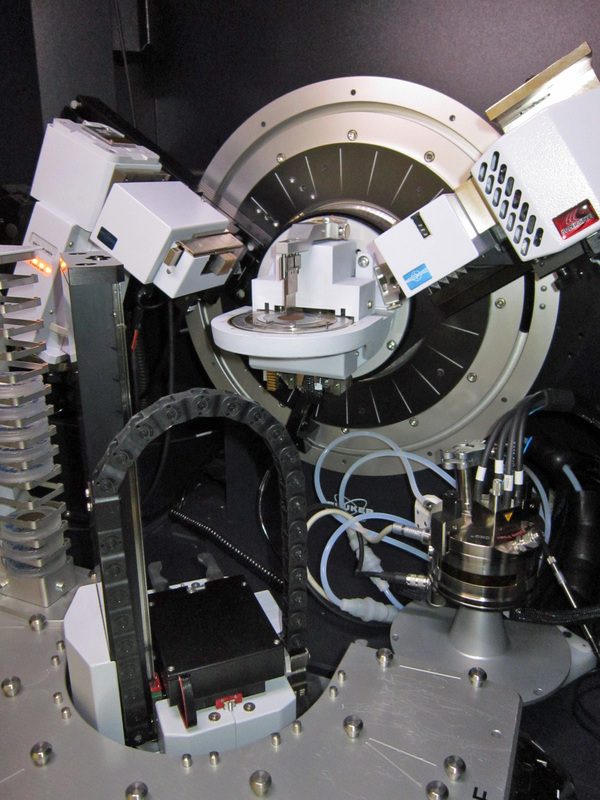 The system is build around an upright Axio Examiner.Z1 microscope and has two non-descanned detectors (NDD) and a transmitted light detector. One W-Plan-Apochromat 20x/NA=1 DIC(UV) VIS-IR water dipping objective is available. It is apochromatically corrected from VIS to IR and designed for use without cover slip. A ventilated table for Pathological dissection. It contains hazards by pulling air through the peripheral edge of the table preventing users inhaling contaminated air. Luminescence is excitation of a molecule resulting in fluorescence caused by a chemical reaction, either a biological one, bioluminescence, or a purely chemistry based one, chemiluminescence, or by an external light source resulting in photoluminescence. 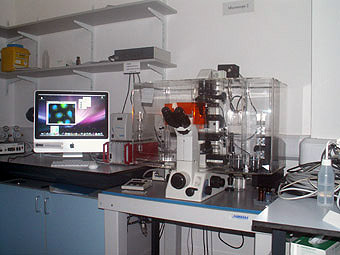 Normal fluorescence microscopes are an example of photoluminescence. The LV200 makes use of bioluminescence and chemiluminescence. Because of the lack of a light source there is no background or autofluorescence when using luminescence imaging resulting in a high signal-to-noise ratio. 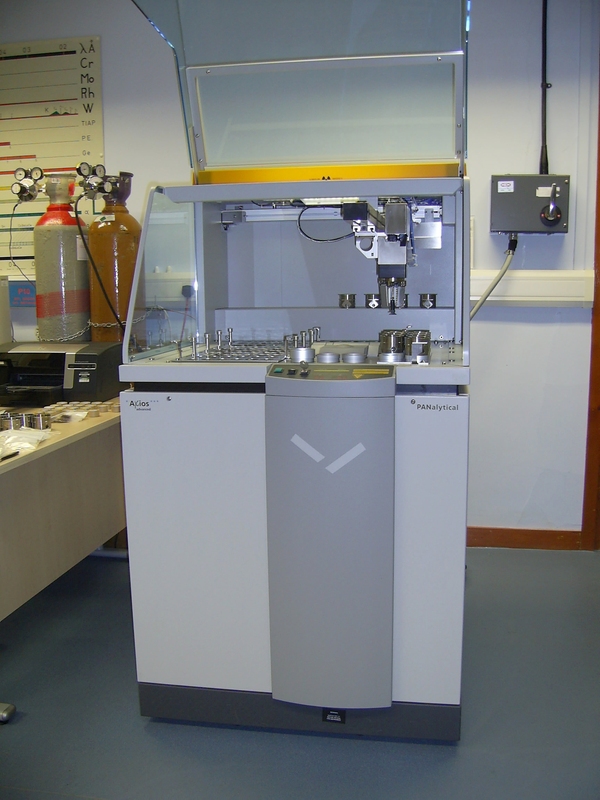 Specifications for the LV200 This system is specifically developed for bioluminescence imaging. A built-in system for temperature control, humidity, and gas flow helps to keep the cultured cells or tissue slices healthy for long time (days) experiments. The system can handle small samples in 35 mm dishes. LV200 with closed condenser (left) and with upwards turned condenser (right) revealing the culture chamber. An Hamamatsu C9100-13 EM-CCD camera is used for image acquisition. This allows fast imaging at low light levels (using EM-CCD mode) as well as long exposures times at low light levels (using most likely CCD mode). Pixel size of the camera is 16 x 16 µm with an image size of 512 x 512 pixels. The system has a high NA tube lens optimized for luminescence imaging with a 0.2 x magnification, all objectives have therefore an effective magnification of magnification x 0.2 (2x, 4x, 8x and 12x). Meeting room equipped with Brahler interpreting booths, microphones and headsets. 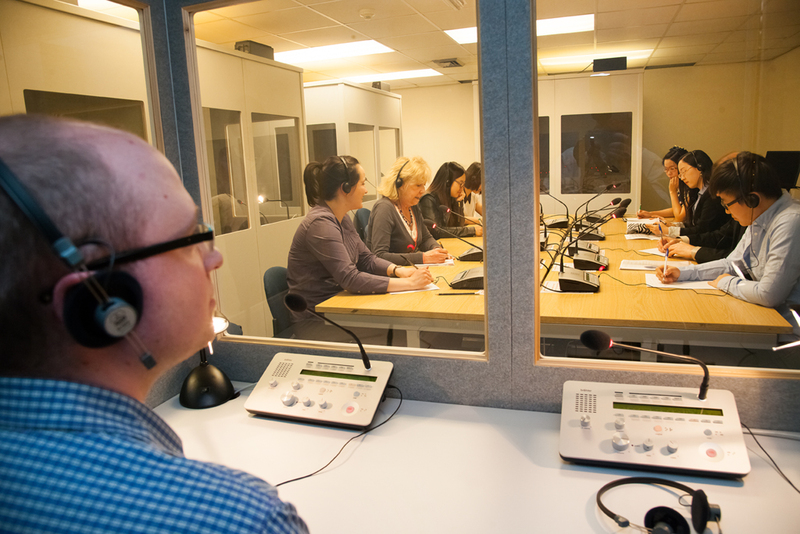 This allows multi-lingual meetings to take place with interpreters in a number of languages providing simultaneous interpreting from the booths. 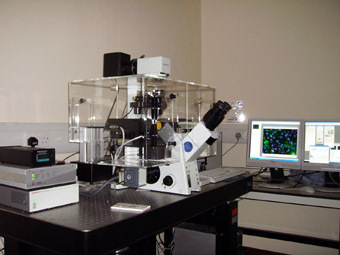 Nikon microscope 2 is a TE300 semi-automatic microscope with manual XY control. The imaging part of the system is automated and controlled by Improvision's Openlab software, running on a Mac (OS X). 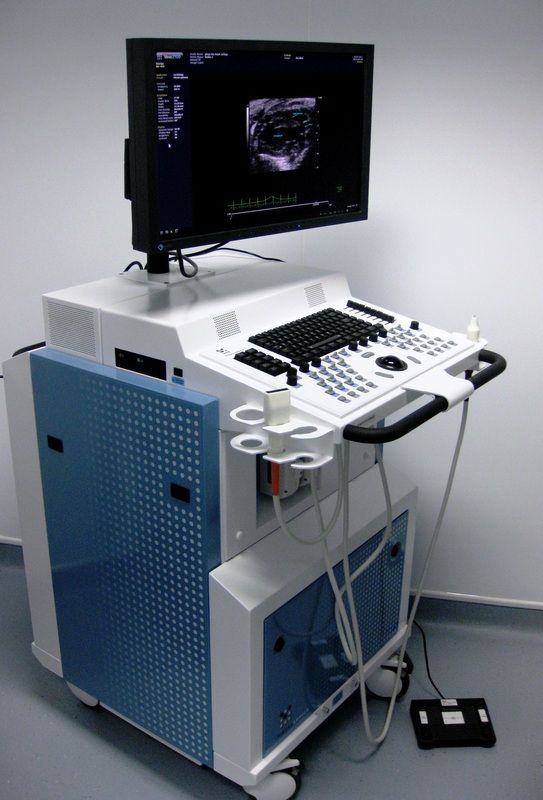 The system is equipped with an Hamamatsu ORCA-R2 digital camera (pixel size 6.45 x6.45 µm) and an X-cite120 fluorescence illumination system. This system is equipped with a temperature controlled and CO2 fed environmental chamber. The CM1950 Clinical Cryostat is for high quality sectioning, increased user safety, and efficient workflow. 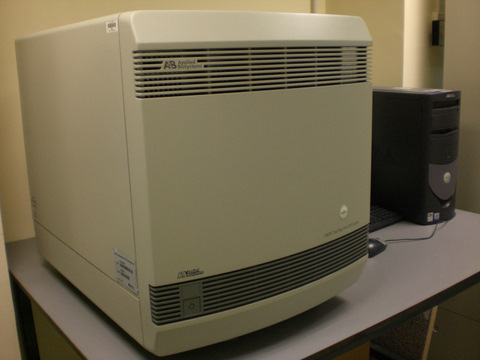 The Applied Biosystems 3730 sequencer is used to provide high-throughput low-cost DNA Sanger sequencing. A range of services are offered from full template preparation through to simple low-cost analysis of completed sequence reactions. In addition samples can be submitted for DNA fragment analysis. The Dimension 3D printer uses ABSplus thermoplastic to build models. The 3D printer heats plastic filament at to a semi-liquid state at the print head, where it is extruded in thin accurate layers. Once the prototype has printed you remove the recyclable base of the 3D printer and snap off the model. CatalystEX software is used to convert CAD program’s STL output into 3D modelling print paths. The software allows a 3D view of the model or models to be printed, the model to be scaled to the desired size and control. 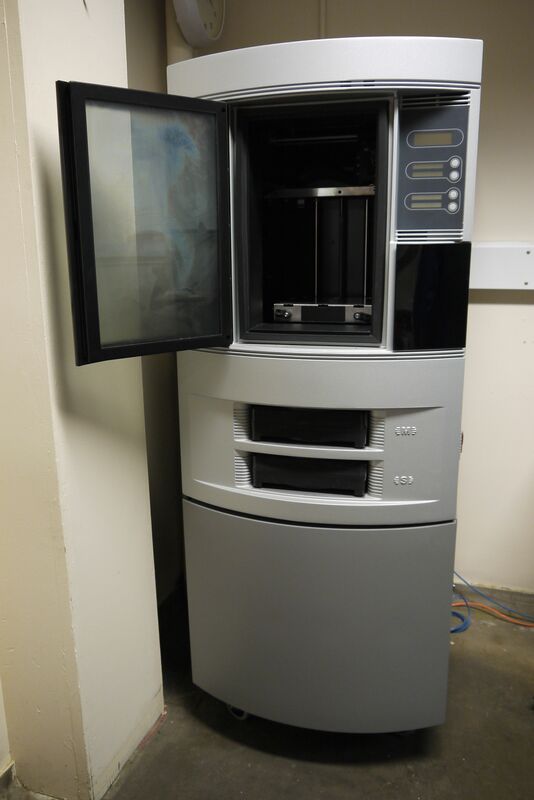 The Dimension 3D printer allows models of sizes up to 203 x 203 x 305 mm (8 x 8 x 12 in.). There are three colours (Red, Black and White). 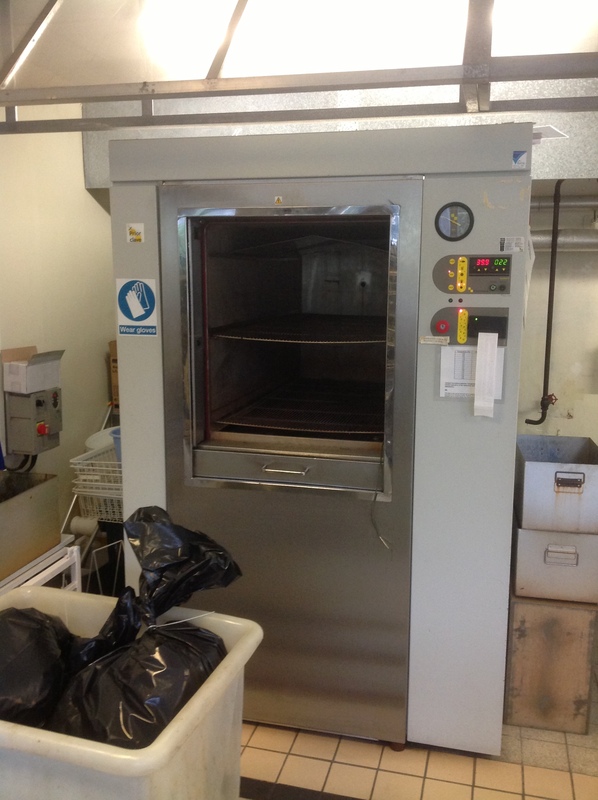 Front loading 700L rectangular section Priorclave autoclave with vertical power door, for equipment sterilisation. Fitted with two non-tipping shelves, stainless steel basket,waste containers and loading trolley. 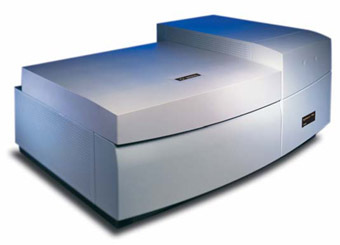 TCS stands for True Confocal Scanner and SP5 for the 5 SpectroPhotometer channels this system is equipped with. The microscope is a Leica DMI 6000 CS inverted microscope with a motorized XY-stage and Z-drive motor focus on the microscope stand (100 nm step size) as well as a SuperZ Galvo stage (1500 µm travel range) for higher speed and accuracy. 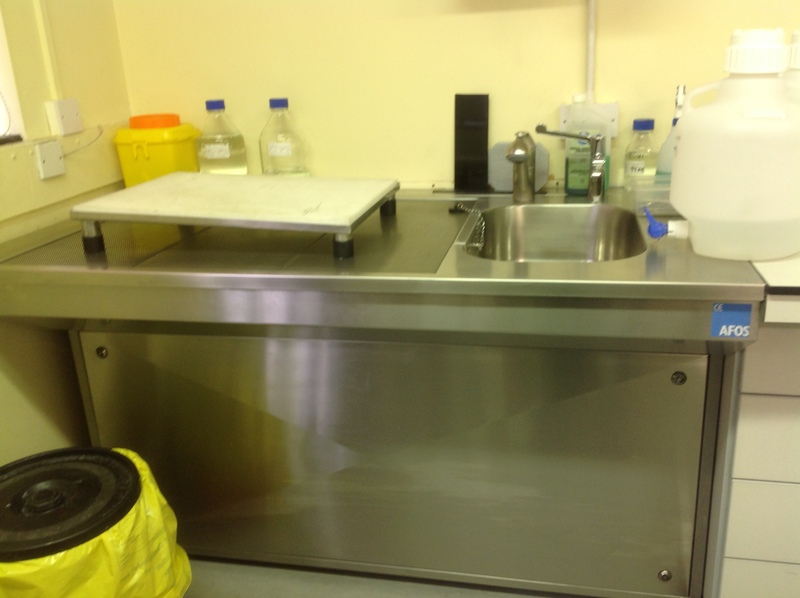 An incubator is fitted on the microscope stage and CO2 can be piped into this chamber for live cell imaging. In addition to standard PMTs at position 1, 3 and 5 this system has very sensitive HyD SP GaAsP-detectors at position 2 and 4 which combine high-sensitivity with low noise. The SP5 uses an acousto-optical tunable filter (AOTF) to control the excitation laser light and an acousto-optical beam splitter (AOBS) instead of filter blocks to send the excitation laser light to the sample and to reflect the emitted light from the sample into the scan head. This is a more light efficient way than using glass di- or multichroic mirrors and filters. Besides the 5 detectors for detection of fluorescence light there is one detector for the detection of transmitted light. Keep in mind that light going to the transmitted light detector does not pass the pinhole and therefore is not one optical z-section! 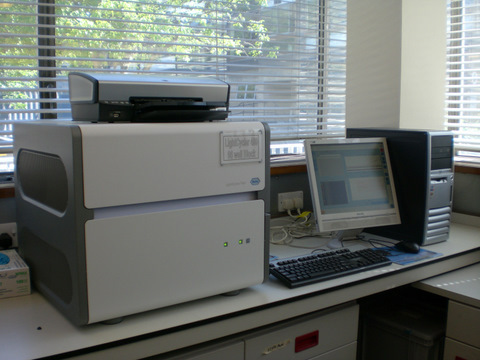 The Voyager DE-STR MALDI-TOF mass spectrometer is used by the University of Leicester Proteomics Facility for Peptide Mass Fingerprinting of single proteins for identity. The Leica RM2125 RT manual microtome has the essential features you need for safe, economic sectioning and optimized workflows. The 9.4T MRI machine generates data suitable for a range of projects including quantification of anatomical and structural studies, and analysis of neurological functionality. The Nikon C1Si CLSM is build on a Nikon eclipse Ti microscope stand equipped with 4 lasers resulting in the laser lines: •405 nm •457 nm •488 nm •514 nm •561 nm •640nm. The system is filter block based and has 4 detectors (PMTs) which can be used as 3 fluorescence and one transmitted light detector or in a configuration with 4 fluorescence detectors. Besides the standard PMTs this system has also a spectral detector unit with an array of 32 PMTs. This array makes for fast spectral imaging with a resolution of 1.5 nm, 5 nm or 10 nm and is the fastest microscope based spectral imager in our facility. The Nano Indenter G200 is for nanomechanical testing. Electromagnetic actuation allows for range in force and displacement and measurement of deformation over six orders of magnitude It’s applications include semiconductor, thin films, and MEMs (wafer applications); hard coatings and DLC films; composite materials, fibers, and polymers; metals and ceramics; and biomaterials and biology. The Leica EG1160 embedding centre has a separately-heated paraffin dispensing system with an integrated filter which provides a constant, reproducible paraffin flow at ten different flow rate settings. All instrument functions, including the automatic starting time, are easily individually programmable. Front loading 150L rectangular section Priorclave autoclave with vertical power door, for equipment sterilisation. 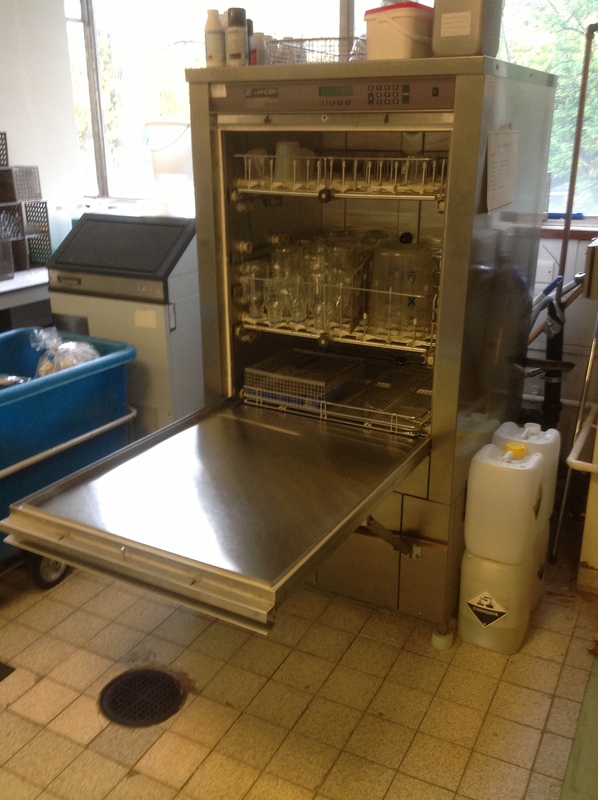 Fitted with two non-tipping shelves, stainless steel basket,waste containers and loading trolley. 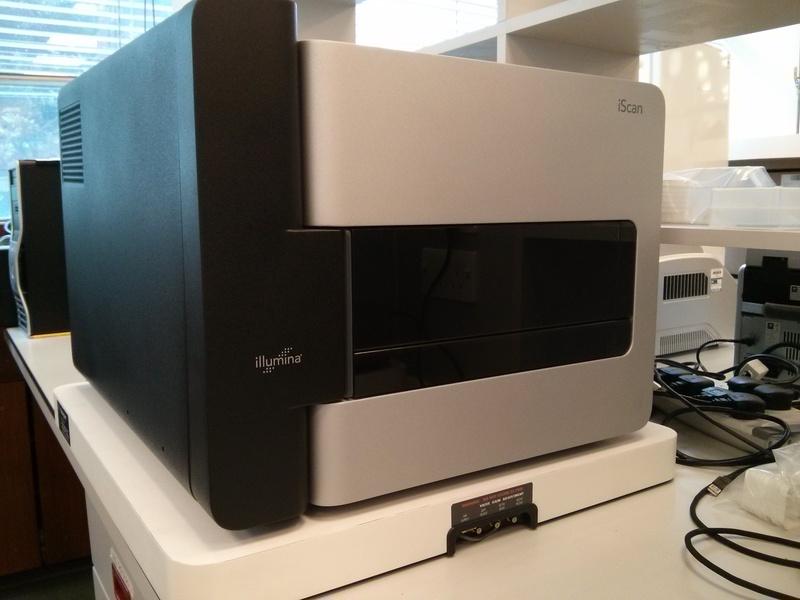 The Illumina Beadstation 500 allows a wide range of DNA/RNA analysis applications on a platform that can use customisable as well as ‘off the shelf' arrays. 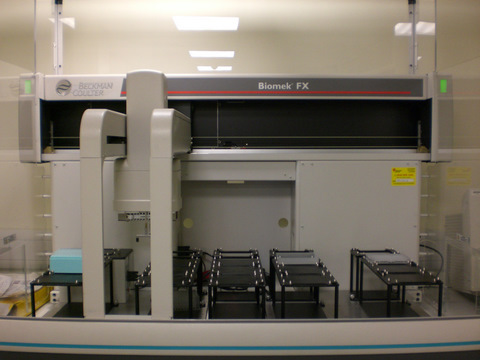 The system employs a multi-sample slide approach that allows for a high-throughput of samples with a very high slide feature density. Applications include SNP genotyping, gene expression, copy number variation, DNA Methylation, and low-multiplex analysis. 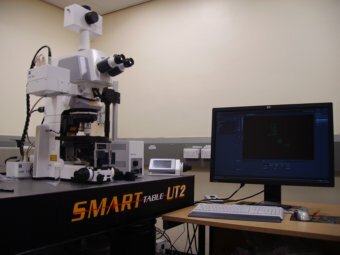 This microscope is an inverted IX81 motorized microscope which combines the Scan^R screening platform and Cell^R imaging station in one system. 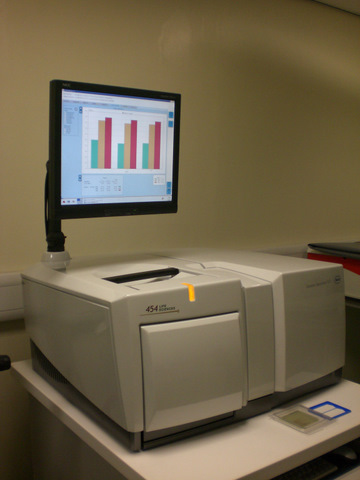 The Scan^R screening platform can be used for assay development and high-content screening using multiwell plates as well as single slides. 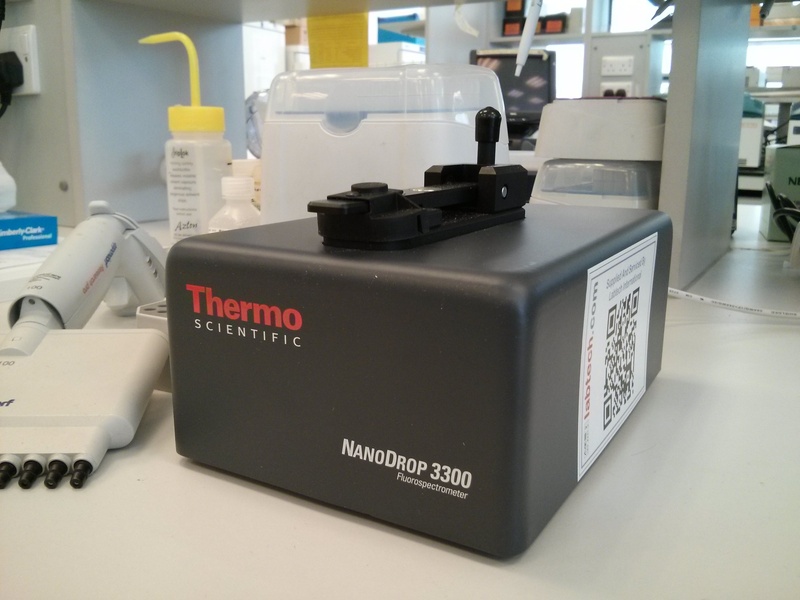 This makes it possible to screen both large and small numbers of samples. It has fully automated image acquisition which allows the user to select the number of images per well, the number of wells and the different filter sets. Many brands of multiwell plates are preprogrammed. Results can be analyzed with the powerful image analysis software for automated object detection and cell separation using histograms and gating settings to include or exclude data sets. For live cell imaging as well as for imaging of fixed materials the Cell^R option can be used. This allows fast acquisition and multiple position imaging for many hours. Protocols can be written in the Cell^R software to do complicated image and filter sequences. This system is equipped with a Hamamatsu ORCA-AG CCD camera (pixel size 6.45x6.45 µm), DIC objectives, hardware ZDC (Zero Drift Compensation) and software autofocus, linear encoders for high xy-precision, CO2 and a stage incubator for live imaging. In June 2013 we updated the CellR software to the new Xcellence software, version 1.2. This software replaces the CellR software but has basically the same look and feel. The ScanR Acquisition and ScanR analysis software have been updated to version 2.4.0.13 for Acquisition and 2.4.0.11 for Analysis. Filter wheel with excitation filters for: DAPI (350/50) FITC (492/18) TxRed (572/23) CFP (430/25) GFP(470/22) YFP (500/20) mRFP (556/20) Cy5 (640/30). We have a second licence for both the Scan^R analysis software and the Cell^R software to analyze data on the analysis computers in room G1a. 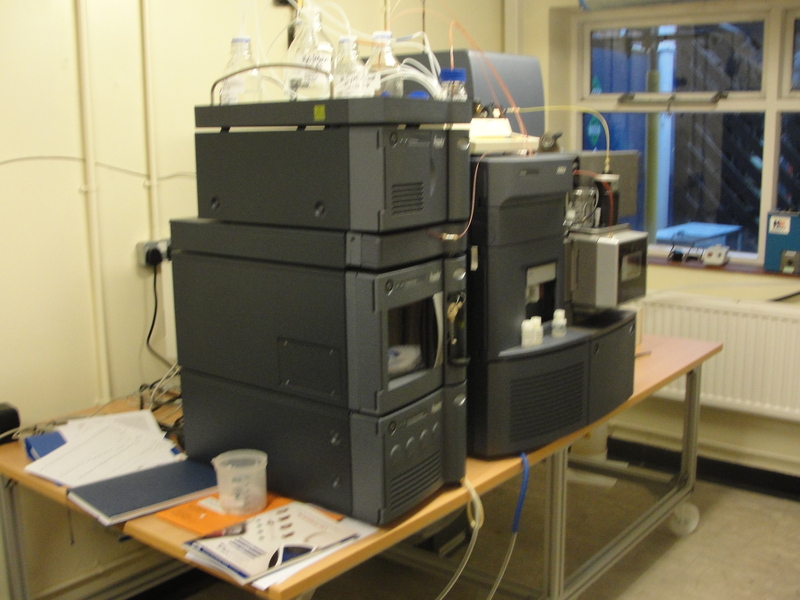 UPLC-MS system using an Electrospray ionisation Time of flight Mass Spectrometer to determine exact masses within 3ppm or better. UPLC allows HPLC separations to be conducted in much shorter time spans and usually with smaller sample volumes. Simple single compound determinations or more complex mixtures can be handled giving Exact mass, MSMS and Formula prediction, the only requirement being that the species is ionisable by Electrospray. A flexible liquid handling system enabling automation of laborious pipetting tasks such, equipped with a 96 tip head. Specifications for the LAS4000 This system is equipped with 3 LED light sources (460nm, 520nm and 630 nm) as well as a white light illuminator. 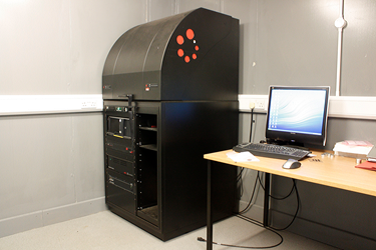 Besides gel imaging the large darkroom cabinet allows also imaging of larger samples, like whole plants. The 1400 LXP washer dryer allows for fast cleaning cycles, multi-level injection washing. It has interchangeable racks which can fit all types and sizes of glassware with easy and safe loading. Repeated and accurate intake of cleaning chemicals is allowed for by automatic peristaltic dosing pumps. Powerful and rapid HEPA filtered drying is achieved through injectors and in wash chambers. The chamber is high grade 316L stainless steel. 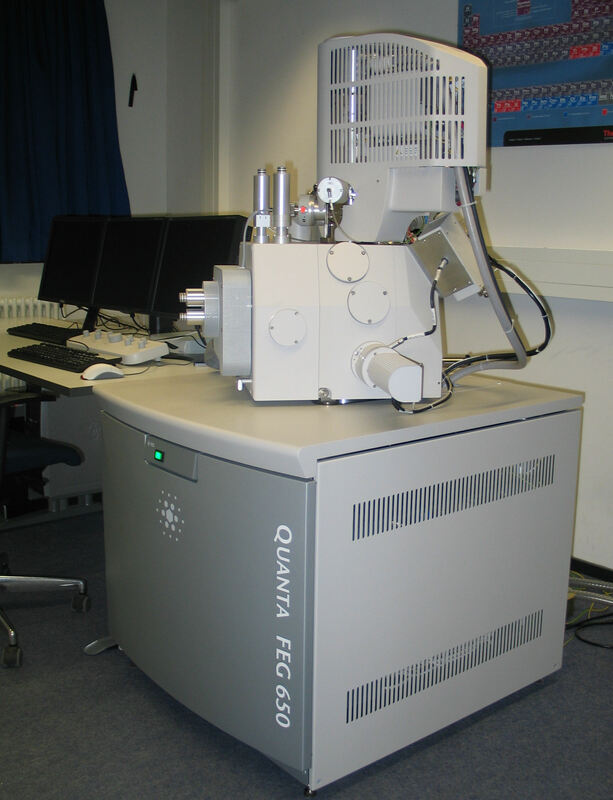 The Quanta 200 3D is a dual-beam scanning electron microscope (SEM) and focused ion beam (FIB) instrument. Combining these two techniques creates a versatile tool for sub-micron scale material removal and characterization. 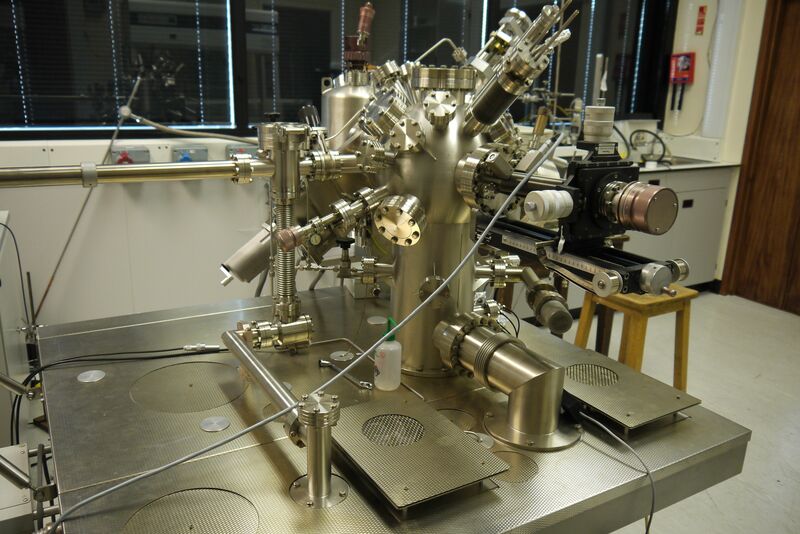 This microscope is mainly usedfor preparing site-specific cross sectional specimens for transmission electron microscopes (TEM). 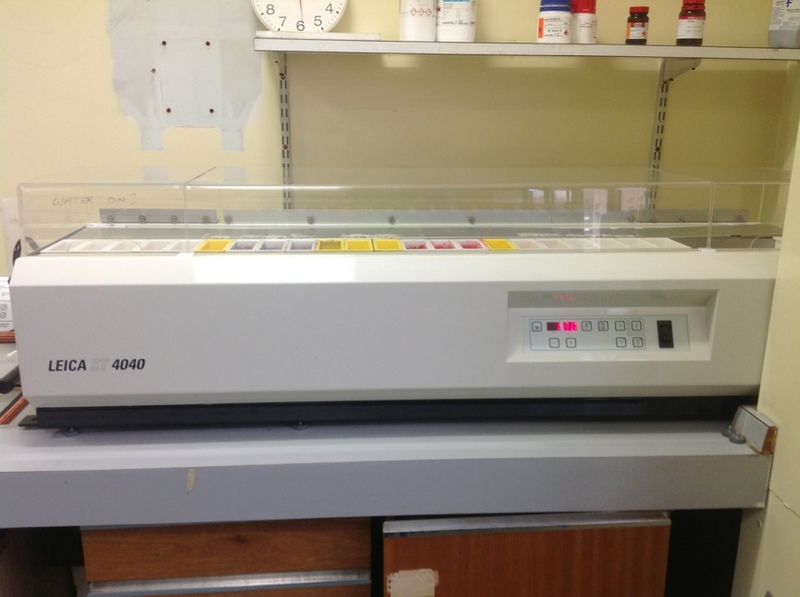 384 well format real time PCR machine. Suitable for gene expression or SNP genotyping studies. 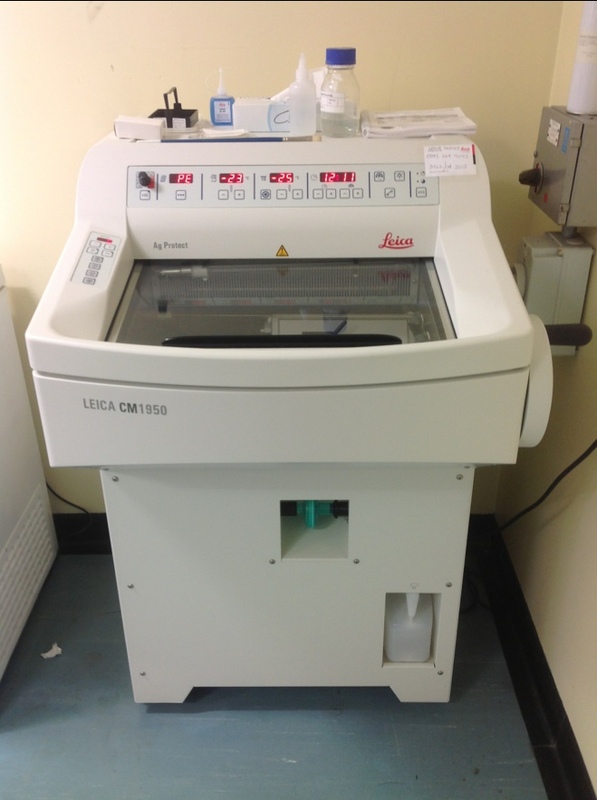 On the Leica ST4040 routine applications such as H&E (Hematoxylin and Eosin) can be run at a throughput capacity of up to 2000 slides per hour. The modular design of the system allows flexibility in instrument configurations to meet staining volume and workflow needs. This highly-sensitive system detects bioluminescent and fluorescent signals, for non-invasive longitudinal studies of animals including cell trafficking, gene expression, drug therapies and disease progression. 3D tomography allows in-vivo source localisation and selective excitation/emission filters spanning 430-850 nm's permit multiple fluorescent sources within the same animal to be detected. Images can be co-localised with data from the Quantum FX MicroCT for greater anatomical analysis. 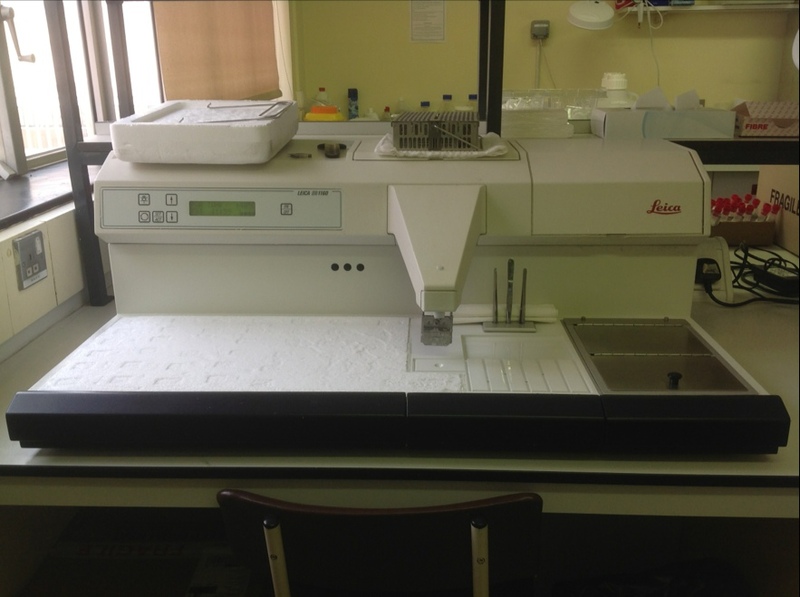 A highly sensitive real time PCR machine for use in gene detection, gene expression and gene variation analysis studies. Suitable for many different assays and chemistry options. Both 96 and 384 well formats are available to users. 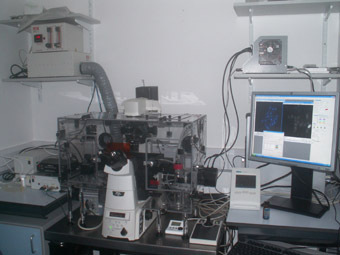 Nikon microscope 1 is a TE300 semi-automatic microscope with automated shutters microscope with automated shutters and filter wheels and manual XY control. The imaging part of the system is automated and controlled by Improvision's Openlab software, running on a Mac (OS X). 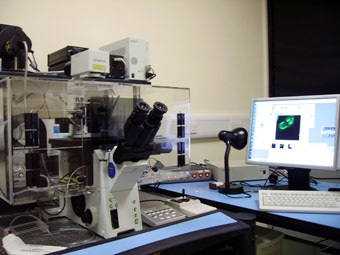 The system is equipped with an Hamamatsu ORCA-R2 digital camera (pixel size 6.45 x6.45 µm) and an X-cite120 fluorescence illumination system. A TransferMan NK manipulator from Eppendorf is mounted on the microscope stage and can be used with the Eppendorf microinjection system. There is an heated insert to keep the dish with cells on temperature. 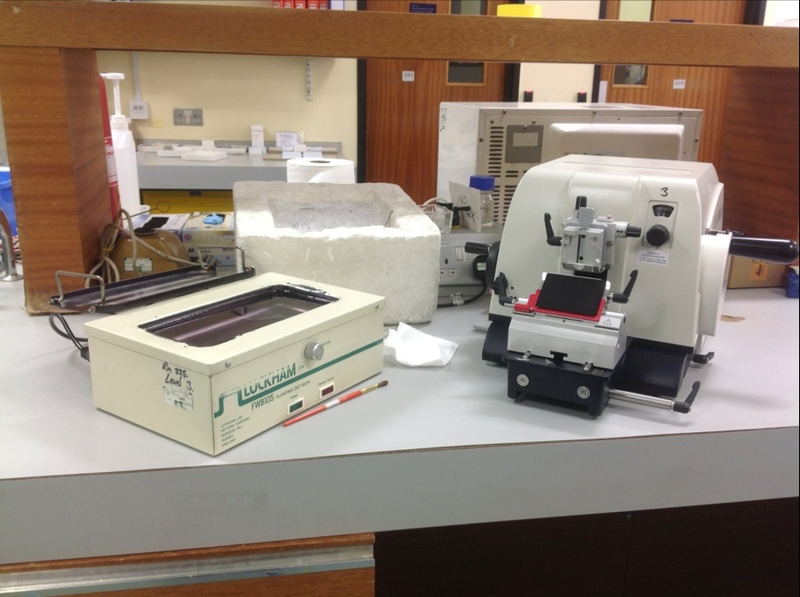 This system can also be used for imaging of slides. Keep in mind that you have to turn your slide upside down, so the coverslip has to be sealed well. It provides very high resolution images of surface topography of samples in Ultra-High Vacuum (UHV) by using a very sharp tip scanned across the surface. It can work in Scanning Tunnelling Microcopy (STM) mode that can produce atomic resolution images of metal surfaces or in Atopmic Force Microscope (AFM) mode that can get 1 nm resolution images of insulating surfaces. 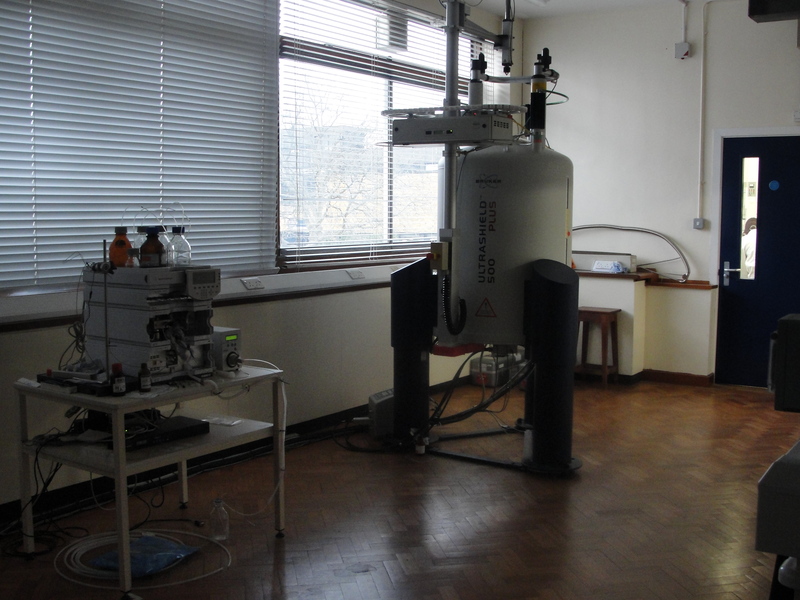 The UHV environment means that imaging can be done on reactive surfaces and the instrument can image surfaces at temperatures in the range 20 K - 1000K. Scanning probe Spectroscopy (SPS) with atomic resolution can also be performed using the instrument. 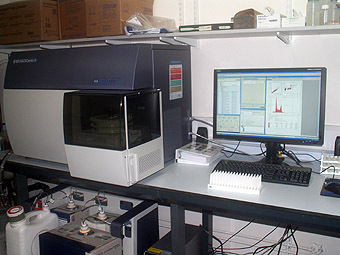 The 4000 Q-Trap system is used by the University of Leicester Proteomics Facility for identifying proteins from simple mixtures and for Selected Reaction Monitoring of peptides. Additional capabilities include precursor and product ion scanning and positive/negative ion switching. 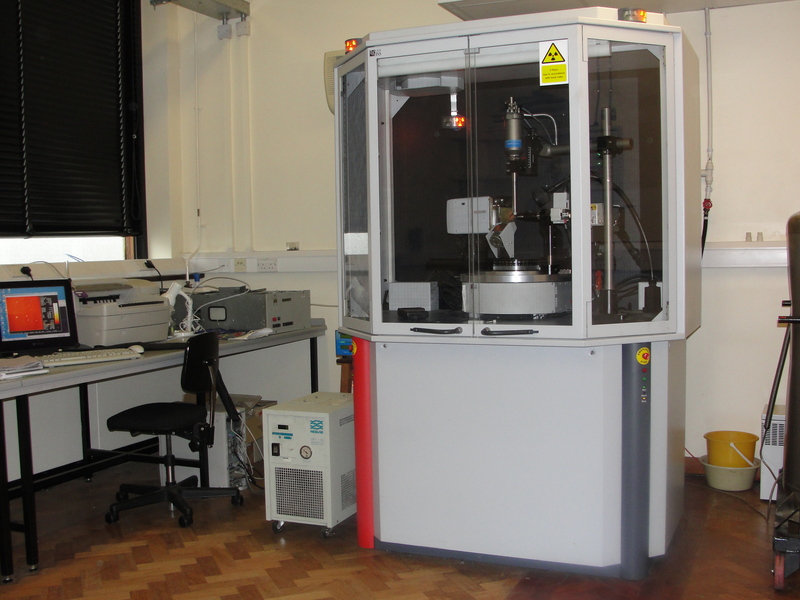 This liquid handling robot is used by the University of Leicester Proteomics Facility trypsin digestion of bands/spots from 1D- or 2D-gels. The selection of the laser line is controlled via an Acousto Optical Tunable Filter (AOTF). The use of an AOTF allows excitation intensity balancing within an image, flexible area bleaching e.g. for FRAP/FLIP/Photo-activation experiments and line sequential scanning to avoid cross-talk between channels (multi-tracking). For detection of fluorescence signal 3 PMT and 2 high sensitive GaAsP detectors (HSDs) are installed + a transmitted light detector. Two of the detection channels are equipped with a galvano grating spectral scanning systems for fluorescence emission detection with variable setting of wavelength band. 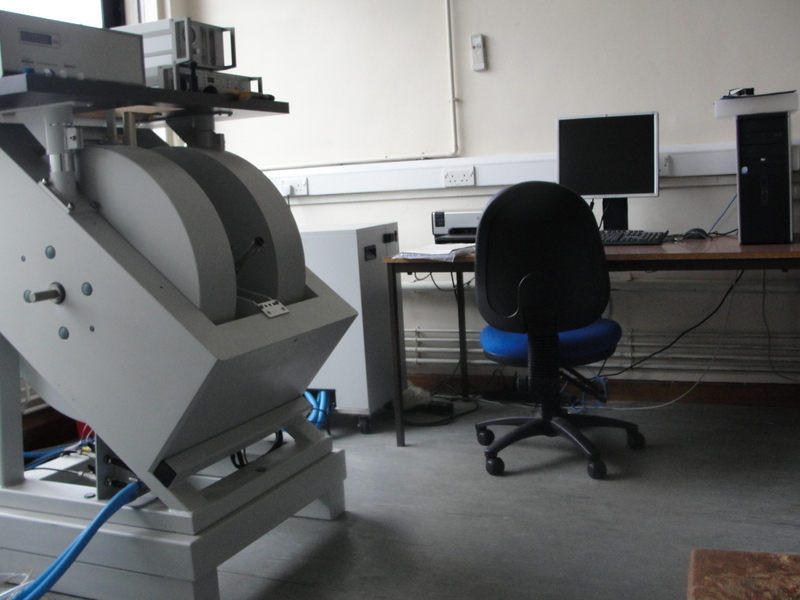 This allows fine tuning of the emission detection and high speed spectral scanning. The spectral range of the PMT detectors is appr. 300 nm to 850 nm. The detectors can be used in two modes (1) conventional photo current detection mode (2) high sensitivity photon counting mode. The JEM-2100 is a multipurpose, 200 kV analytical electron microscope. It has ultrahigh TEM resolution as high as 0.19nm allowing for observation at atomic resolution. 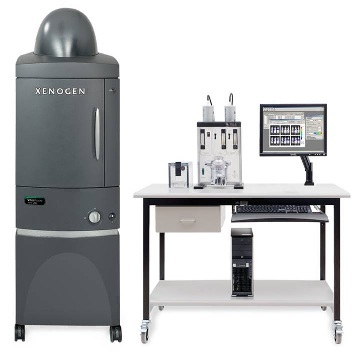 STEM (Scanning Transmission Electron Microscope: option) function integrated in PC control system allows a scanning image of a sample at nanometer resolution. The EDS (Energy Dispersive X-ray Spectrometer) has a 0.28sr of solid angle allowing for highly sensitive analysis at nanometer resolution. The highly stable specimen stage permits long term observation and analysis. 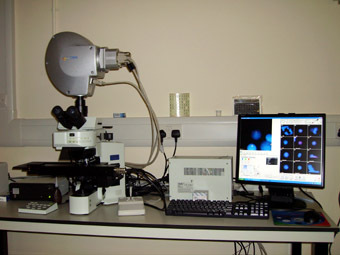 This is a Nikon Eclipse Ti-E microscope stand equipped with COOLLED PrecisExcite High Power LED Fluorescent Excitation System. LEDs are very stable, long lasting, good for live cell imaging and the microscope can be used as soon as the LEDs are switched on. Three wavelengths are available: 400nm, 490nm and 565nm. LEDs with other wavelengths are available and can be added to the system; see CoolLED. 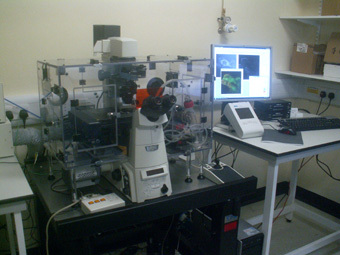 The microscope has a motorized piezo stage for fast Z acquisition with encoders for accurate multiposition imaging. the camera is an Andor iXon EM-DU897, 512 x 512 pixels (16 µm x 16 µm) and a Quantum efficiency of > 90% . 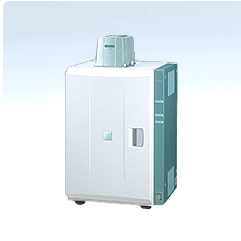 An environmental chamber with temperature and CO2 control is included. 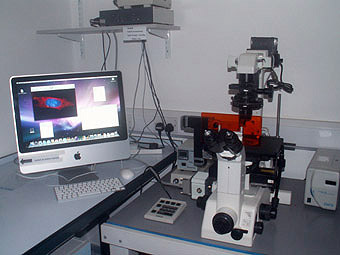 The microscope is controlled via the Nikon NIS-elements software. The Vevo 2100 allows researchers to image the dynamic processes that occur in-vivo using repeatable, label-free imaging. High spatial- and temporal-resolutions capture swift events such as the rodent cardiac cycle, while quantification software generates data-sets ideal for longitudinal studies. Modulation Reference: 10Vpp rectangular input impedance: 50 Ohm, Receiver gain dynamic: 0- 106dB, Gain step size: 1dB, Time constant: 0.01ms-5.24s, ADC Type: integrating, ADC Conversion: 0.16ms- 5.24s per point, ADC Resolution: constant 22 bits automatic calibration of phase and amplitude for any frequency in the specified frequency range, external Trigger capability, Setup Scan futemal Data Buffer E27L Low frequency channel, 1kHz to 6kHz in 0.1 kHz steps, quadrature detection: two channels, multiple modulation (two or more signal channels in series). This instrument is currently out-of-order and is not available for use. 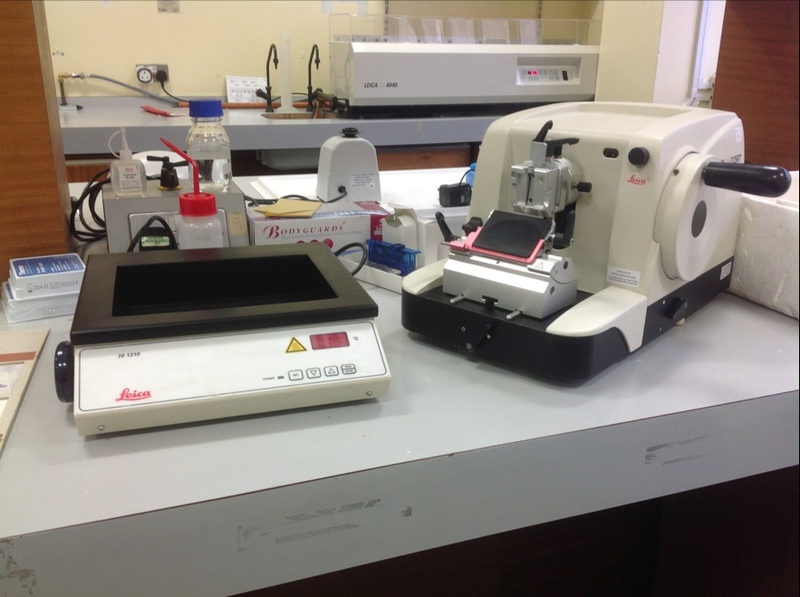 This is an upright BX61 automated microscope with Scanview, Applied Spectral Imaging's scanning platform for various fully automatic scanning applications, which can take 8 slides. The system is equipped with a 12 Bit camera, which functions in two separate modes - direct view (Normal image acquisition) and Fringe mode - which is the spectral mode. The camera has a VDS 2/3 inch CCD chip, is monochrome (B&W) and is not cooled. The pixel size is 6.7 micron (in calculation don't forget to multiple the magnification factor) and the resolution is 1280x1024 pixels. Filters: Narrow-band UV filter (DAPI, Hoechst): exiter filter BP360-370, beam splitter DM400, barrier filter BA420. Narrow-band Blue filter (GFP, Alexa488, FITC, Cy2): exiter filter BP470-490, beam splitter DM500, barrier filter BA515. Narrow-band Green filter (Alexa546, TRITC, Cy3): exiter filter BP530-550, beam splitter DM570, barrier filter BA590. Sky filterset from Applied Spectral Imaging. The Leica RM2235 is designed for manual routine paraffin sectioning but can also be used for cutting harder materials. It allows precision sectioning and an extra measure of control during manual sectioning. The one-piece, protective housing provides long product life and the compact base features a wrap-around, magnetized waste tray for space-saving convenience. 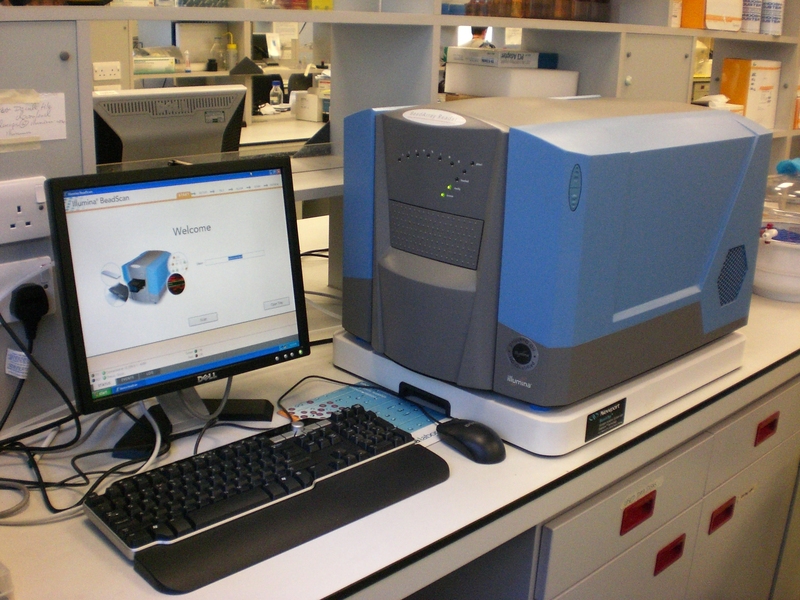 The LTQ Orbitrap Velos ETD instrument is used by the Proteomics Service for identifying and quantifying proteins and post-translational modifications. Image hydrated samples. Crystallization or phase transformation during humidity or thermal cycling. Particles in suspensions or self-assembly processes. Corrosion in metals. 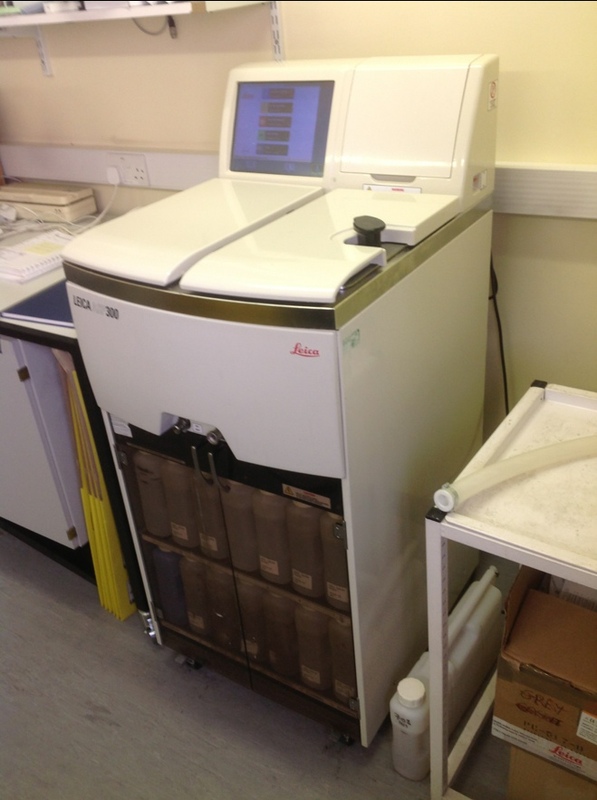 The ASP300 is a fully enclosed, stand-alone system for processing of up to 300 cassette-embedded tissue samples. This tissue processor combines proven technology with an innovative user interface, colour touch screen and easy to use, yet powerful software. Many routine user operations are simplified to reduce operator involvement and the risk to make mistakes. High-throughput (≥18 second scan-times), low dose radiation imaging for repeatable pre-clinical studies. Images can be co-localised with the IVIS Spectrum system for greater data analysis. Laser Doppler Vibrometry is recognised as the most precise and powerful measurement tool in the field. 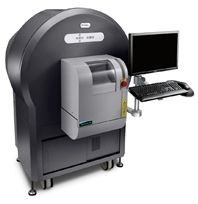 Rapid scanning, complex structure measurement, fine detail, any material. 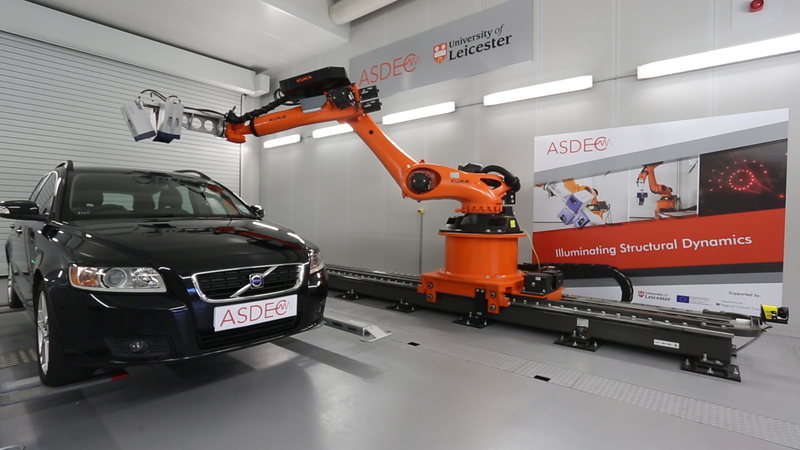 Scanning up to large vehicle size (3500kg) can be accommodated in the facility. 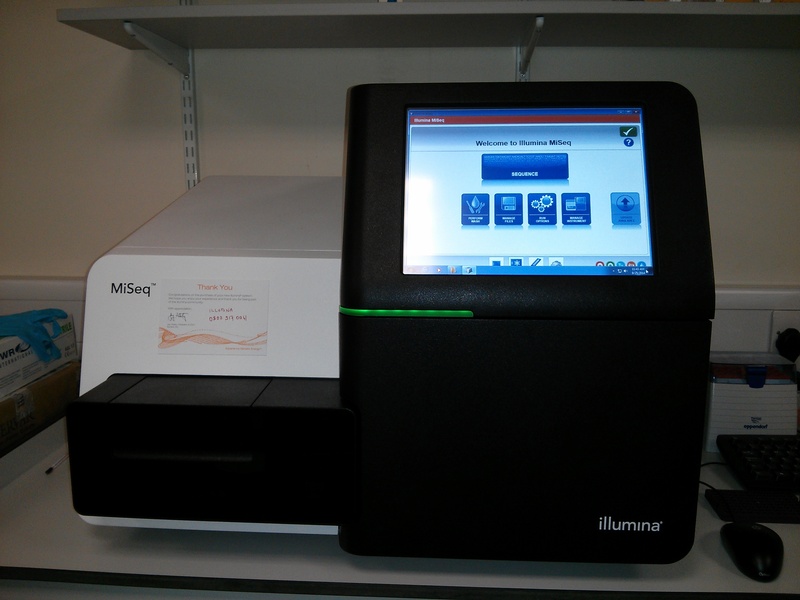 A highly flexible platform enabling cost effective sequencing, multiplexing of samples and different sample loading options. Suitable for many research applications including de novo sequencing of complex whole genomes and BACs, resequencing, transcriptome analysis, metagenomics and microbial diversity, sequencing of full-length cDNA, and splice variant discovery.